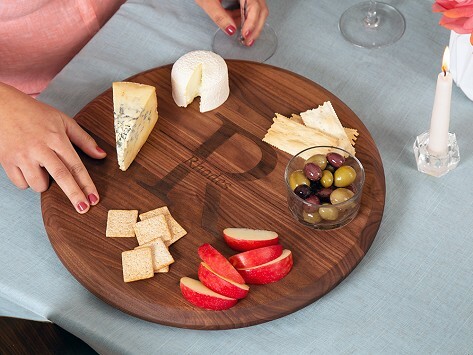 This personalized lazy Susan is a new spin on a traditional serving piece that makes a statement, or can make for a stand-out gift. It’s crafted from long-lasting and durable natural maple or walnut wood and finished by hand to let the wood's distinctive grain shine through. A laser-engraved name adds a personal touch, while rubber feet and rust-proof stainless steel screws lend functionality. Made in the USA. Dimensions: 21" x 20" x 2"